(a)The availability of goods to any given customer cannot be guaranteed by Barrier Hire London until a booking is confirmed. Cleared payment of the required deposit as minimum requirement. Acceptance of Barrier Hire London’s terms and conditions. Payment is also considered acceptance of Barrier Hire London’s terms. These are available in numerous formats on request at any time. 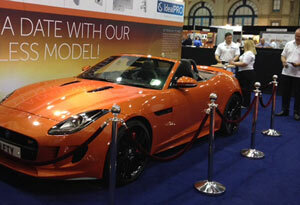 (c)Cheques should be received by Barrier Hire London at least 7 working days in advance of the event. When the cheque is cleared, your booking is confirmed. (d)Barrier Hire London can take no responsibility for the change of availability of the goods during the time before cleared payment. (e)Barrier Hire London reserves the right to decline acceptance of any payment method(s) at its own discretion. Likely examples of this are cash on collection or late requests to pay by cheque or invoice/purchase order. (f)Quotes are valid for no more than 7 days. They may be withdrawn at any time. Only written quotes from a Barrier Hire London representative may be honoured; telephone and other quotes and prices for services may be dismissed at our discretion. (g)Full payment is due before delivery. (h)All payments made by credit cards or American Express(AMEX) cards will incur a 2% surcharge. (a)All cancellations by the hirer must be made in writing either via email or recorded post. Orders are not cancelled until this is has been received. (It is recommended you confirm our receipt of your cancellation by telephone). (b)There is no charge if orders are cancelled no later than 7 days before hire start date. A full refund will be issued. (c)50% of the hire charge is refunded if orders are cancelled within 7 days of hire start date (up until 2 days prior to contract start date - see (2) (d)). (d) 0% of the hire charge is refunded if orders are cancelled within 2 days of the hire start date. Barrier Hire London will refund delivery costs at its disgression. (e) Deposits are refunded if no hire takes place. (f)Any reduction of order value by the hirer is treated as part cancellation and the rules and charges as outlined above apply. (a) When a Barrier Hire London representative delivers the goods to the agreed site / address, and until a Barrier Hire London representative collects them, the goods are the sole responsibility of the hirer. Human error and damage in transit can occur. It is the responsibility of the hirer to check the goods on arrival and ensure that they are satisfied with the quantity and quality of goods delivered whilst the delivery team is still on site. (c)Goods should be stored in secure, dry conditions. Negligence can result in loss and damage for which relevant charges defined by Barrier Hire London apply. (d)Goods should be returned in clean, dry condition or relevant charges defined by Barrier Hire London apply. (e)Hirers who choose to collect or return goods themselves must use vehicles suitable for this purpose including means of securing the goods safely. 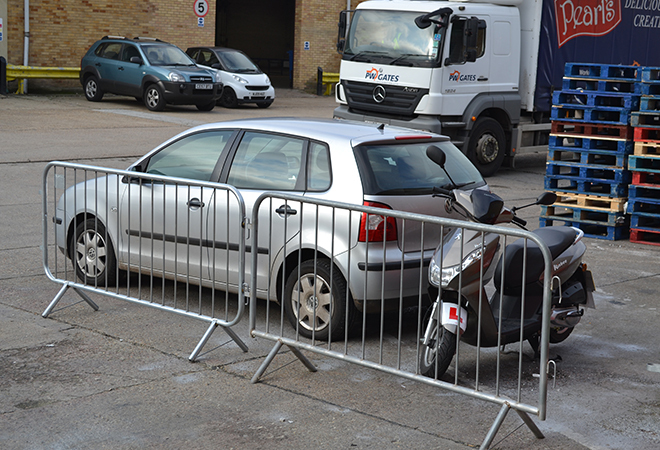 Barrier Hire London reserves the right to refuse the release of hired goods to any customer without a suitable vehicle for the safe carriage of hired goods. (f)Barrier Hire London reserves the right to not leave goods with the hirer, if on delivery it is apparent the goods will not be kept safely or securely. (g)Late returns of goods will incur full relevant hire fees, plus any costs in the instance where other customers are inconvenienced and/or compensated due to the hirer’s late return. 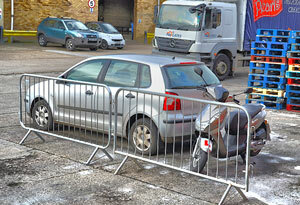 (h) The hired goods and equipment remain property of Barrier Hire London at all times. (a)There are charges for any items hired from Barrier Hire London that are damaged or lost, the costs of which are available on request. (b)Loss also includes, but is not limited to other costs incurred such as loss of staff time through labour, waiting, cleaning etc, inconvenience to other customers as a result of the hirer’s failure to comply with the terms and conditions and agreed hire start end times and other relevant details. (a)Deposit refunds are usually issued by the same means the funds are taken – if you pay by card, you will be refunded by card. (b)We aim to process all refunds within 10 working days of the end of hire, though we cannot guarantee the time it takes to receive the money due to processing times at banks etc. (c) The hirer should contact us if they have not received payment within 14 days of hire end, as something may have gone wrong. (d)The same process applies to any other refund. (a)Customers are responsible for informing Barrier Hire London of any relevant details for loading and unloading, such as parking restrictions, tolls, stairs, distance into building and any other limitations, prior to delivery. Customers will be held responsible for any tickets or costs Barrier Hire London incurs due to failure to inform us, or any delays that happen as a consequence of a customer’s action or inaction. Barrier Hire London may also refuse to deliver or collect in addition to charging, due to breach of any of these guidelines. Customers choice of an approximate, guide window of time as AM (usually 9am-noon) or PM (usually noon-5pm) on Weekdays, weekends may vary. Delivery to the street level/ground floor within reasonable access (up to 10 meters from nearest available parking point) or up to 10 metres in to a building on the ground floor. Please note this may be reduced to narrow corridors and entry points, or if loading is hazardous. Delivery to a single point where the goods may be held safely. The taking of goods up or down any stairs, lifts or escalators. This includes both inside and outside. Unfolding, setting out or folding and stacking any goods. Moving items belonging to a third party in order to gain access. Unscheduled waiting for access to a property for delivery or collection of goods. (a) Barrier Hire London will always endeavour to arrive as scheduled and has a strong track record for being on time. This may not always be possible due to traffic, weather conditions, issues with other jobs and any other delays. For this reason, Barrier Hire London recommends scheduling delivery to a ‘safe’ time which allows for the worst to happen and your event to function with other arrangements. Barrier Hire London can accept no responsibility for a customer’s failure to account for this matter and will not compensate beyond the value of any monies taken for any given job. (b) If Barrier Hire London is at fault and in breach of its agreement with the customer, we may refund partial or whole delivery fees. This will be based on how late we are and whether the customer had allowed sufficient time as per our guidelines to account for this. We have a team of experienced individuals who work with you to ensure your event is a success. An event doesn't just last Monday to Friday. We ensure we are available and delivering to you 7 days a week! Whatever your event, we have the barriers you require. We deliver around all of London and surrounding areas. Why hire barriers for your event? Barriers often go unnoticed at events, but can you imagine what would happen if they were not there? The wellbeing of your guests and the hosts could be compromised, no-go areas could be damaged and crowds could become out of control. Barriers are an essential part of hosting an event, to ensure the public are kept safe, whether it is a black tie event, road works or a building site. You also raise your own profile as a host if your event is well-organised and flows without a hitch. It’s easy to elevate a mundane event and make your guests feel that they are at a prestigious occasion, by laying down a red carpet, complete with rope and post barriers. Where we differ from other supply companies is that we have been in the hiring business for many years and our experienced staff have dealt with every kind of problem and enquiry. They are ready to take your calls. We also have a large London warehouse and always overstock on quantities, which means we can not only always supply your order but at very short notice. 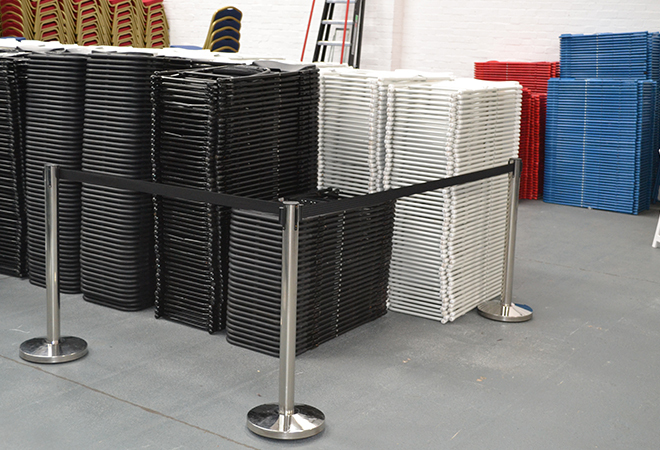 So whatever kind of barrier you require, give us a call and let us supply you with the best in the business. We used barrier hire London when having a party for our daughters 16th birthday. The rope and post barriers really made it seem like a VIP event! 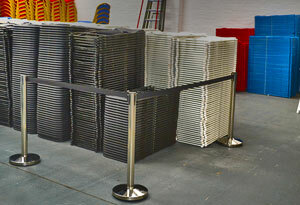 Barrier hire London regularly supply us with tensa barriers when we are hosting our monthly event in central London. Always a pleasure to work with. We would like to thank you for supplying us with roadside barriers at very short notice. The service and delivery times were amazing. Highly recommended. We have a great reputation and as such have delivered all kinds of barriers to the most discerning customers in London and the South East. These include the o2, Aviva, Magnum, and several London boroughs. We value all our customers in the same high manner, so whether you are ordering a couple of items or thousands, you will receive the same high level of customer service. We strive to not only meet your expectations but to exceed them, at every opportunity. Contact Us, we look forward to hearing from you. Copyright © 2016 | Barrier Hire London | All rights Reserved.